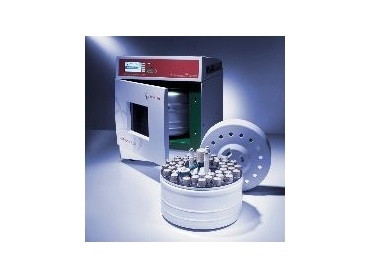 Treats up to 48 samples simultaneously in acid digestion or solvent extraction or synthesis applications. ANTON Paar has introduced the perfect tool for highest throughput in sample preparation: the new Rotor 48MF50 for the Multiwave 3000 microwave platform system. With the new rotor, Anton Paar is providing the highest numbers of vessels available in automated microwave digestion. Up to 48 samples can be treated simultaneously in acid digestion or solvent extraction applications. Typical samples such as environmental, agricultural and biological materials, food, glass or metals are prepared safely and economically with sophisticated reaction control using remote pressure and temperature sensor technology. With an operation range up to 200°C and 20Bar, the Rotor 48MF50 complies with the requirements of microwave standard methods such as EPA 3051 and 3052. The scope of digestion applications comprises aqua regia leaching procedures as well as total digestions of mixed organic and silicate samples, including RoHS applications. The parallel solvent extraction of 48 samples opens new dimensions of throughput in organic analysis too. The reaction vessels and sensors are designed for easy, timesaving handling without compromising safety. Clean and inert 50mL PFA liners, supported by reinforced PEEK pressure jackets, are hermetically sealed with cone seal screw caps, which contain a metal rupture disk for overpressure protection. An immersing temperature/pressure sensor in one reference vessel provides for precise reaction control. An additional IR-sensor controls the outer bottom temperature of the vessels. The homogeneous microwave field ensures identical reaction conditions at every position. With the powerful air-cooling, which is standard in each Multiwave 3000 oven, cooling times are reduced drastically, even with fully loaded rotors. The Rotor 48MF50 is available from MEP Instruments .